These profiles are designed to help you convert video and audio for cellular phones that do not have specific profiles in the application. You can find out whether your phone is on a CDMA or GSM network by asking your telephone carrier. Determine whether your phone can play 3GP, 3G2 or MP4 files by consulting the phone manual. Depending on the specific requirements for your phone, you may need to change the settings. Predefined profile settings have been created for your mobile. To select media conversion properties for your mobile, click Formats >> Select Device Profiles >> Mobile >> ( Select desired device profile ). There are four video profiles for cell phones: Cell Phone Video for CDMA Network (3GP), Cell Phone Video for GSM Network (3G2), MPEG 4 Video for Cell Phones (*.mp4) and WMV Video for Cell Phones. 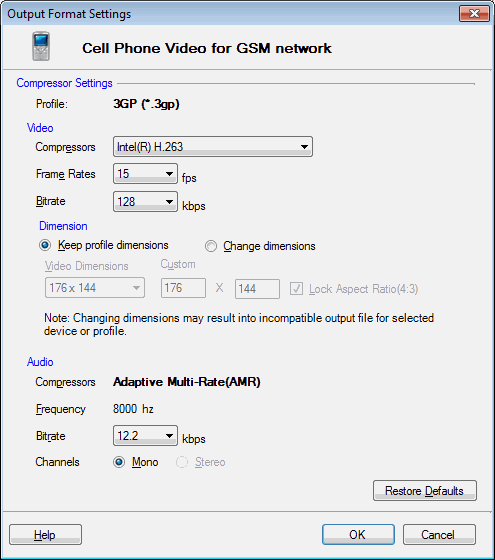 This is an example of a Cell Phone Video for GSM Network video device profile. The video files are produced in 3GP (*.3gp) format. The main advantage of Intel(R) H.263 (AVC) compressor is that it takes less space than other compressors for same quality. The frame rate is set at 15 Fps and bitrate is 128 Kbps. For this device profile, you can choose among 3 compressors; XviD Encoder, Intel(R) H.263 and MPEG 4. The codec are listed in order, from most compatible to least compatible and from good compression to the best. This is an example of a Cell Phone Audio device profile. 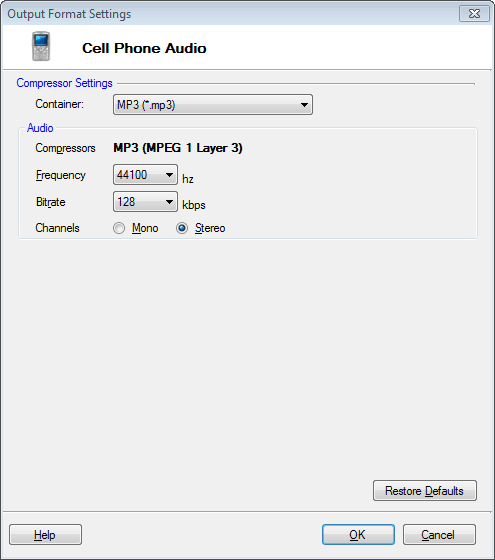 By default, the audio file format and compressor is MP3 (MPEG 1 Layer 3). You can change the file format and the compressor to Advanced Audio Codec (AAC-LC). The frequency is set to 44100 Hz and bitrate is 128 Kbps. The Stereo audio channel creates an impression of sound heard from various directions.